ZapGo Ltd (“Zap&Go” or the “Company”) is a UK-based technology company that has developed a new category of energy storage device—the Carbon-Ion™ (C-Ion®) cell—that combines the capacity and slow discharge performance of lithium-ion (Li-ion) batteries with the time to charge, safety, and environmentally friendly features of supercapacitors. The Company believes that its proprietary C-Ion® technology provides a better alternative to the current Li-ion batteries used in products such as mobile phones, cordless power tools, and electric cars. This is because C-Ion® charges much faster than current Li-ion batteries, eliminates Li-ion’s flammable components (which can create a safety and fire risk), and is still able to deliver energy storage capacity that is more in line with Li-ion batteries. 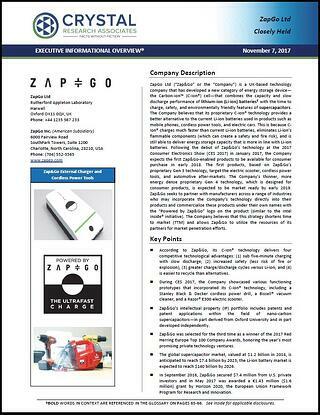 Following the debut of Zap&Go’s technology at the 2017 Consumer Electronics Show (CES 2017) in January 2017, the Company expects the first Zap&Go-enabled products to be available for consumer purchase in early 2018. The first products, based on Zap&Go’s proprietary Gen 3 technology, target the electric scooter, cordless power tools, and automotive after-markets. The Company’s thinner, more energy dense proprietary Gen 4 technology, which is designed for consumer products, is expected to be market ready by early 2019. Zap&Go seeks to partner with manufacturers across a range of industries who may incorporate the Company’s technology directly into their products and commercialize these products under their own names with the “Powered by Zap&Go” logo on the product (similar to the Intel Inside® initiative). The Company believes that this strategy shortens time to market (TTM) and allows Zap&Go to utilize the resources of its partners for market penetration efforts. According to Zap&Go, its C-Ion® technology delivers four competitive technological advantages: (1) sub five-minute charging with slow discharge; (2) increased safety (less risk of fire or explosion); (3) greater charge/discharge cycles versus Li-ion; and (4) is easier to recycle than alternatives. During CES 2017, the Company showcased various functioning prototypes that incorporated its C-Ion® technology, including a Stanley Black & Decker cordless power drill, a Bissell® vacuum cleaner, and a Razor® E300 electric scooter. Zap&Go’s intellectual property (IP) portfolio includes patents and patent applications within the field of nano-carbon supercapacitors—in part derived from Oxford University and in part developed independently. Zap&Go was selected for the third time as a winner of the 2017 Red Herring Europe Top 100 Company Awards, honoring the year’s most promising private technology ventures. The global supercapacitor market, valued at $1.2 billion in 2014, is anticipated to reach $7.4 billion by 2023; the Li-ion battery market is expected to reach $140 billion by 2026. In September 2016, Zap&Go secured $7.4 million from U.S. private investors and in May 2017 was awarded a €1.43 million ($1.6 million) grant by Horizon 2020, the European Union Framework Program for Research and Innovation.